Hi, I am interested in your 1978 Chevrolet El Camino (stock #5011-CHA) listed on Autotrader for $16,995. I'd like to get more information about this vehicle and confirm its availability. 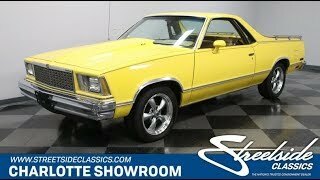 This 1978 Chevrolet El Camino has been given all the right investments in an upgraded big block V8, comfy A/C interior, a cool paint scheme, and plenty more. So yes, every so often you can get everything you want in a distinctive classic without having to break the bank. Bright yellow is a great way to grab attention, and when you have a big block classic, thats exactly what you want to do. As it draws you in closer, youll love details like the contrasting black pinstripe that follows the curve of the profile and even warps around the tailgate. Plus, theres some nice shine with the bright bumpers, complete side trim (including wheel arches,) and the bed rails. The performance nature is instantly recognizable with upgrades like the cowl hood and 17-inch American racing Torq Thrust wheels. Inside is a nice mix of factory components with the right upgrades. It starts with a split-bench that offers dual armrests, so you can decide between extra seating or bucket-like comfort. The tan velour cloth here nicely coordinates with the door panels, dash, and carpeting for a uniform factory feeling. There are nice luxury items like the power windows, upgraded AM/FM/CD stereo, and modern R134a air conditioning. The later model sports steering wheel is another reminder that theres something special under the hood even before you turn the key and hear it roar. While this generation El Camino was relegated to only small block power, this example fixes that. Its a true big block machine with a true 454 cubic inch V8 filling the engine bay. It has been upgraded further with the right performance goodies like a four-barrel carburetor, an Edelbrock intake, and Edelbrock heads. Its a real upgrade in power you can certainly feel out on the road... and thats exactly where this upgraded El Camino belongs. Its a strong runner setup to be an easy all-day cruiser with features such as a three-speed automatic transmission, power steering, and front disc brakes. And because the El Camino has the suspension of a Malibu, its one of the smoothest riding pickups around. Big power, bold packaging, and the right features make this a standout classic for a terrific price. Dont miss you chance. Call now!